I love a good turkey burger. It’s really fun to add different flavors because the turkey can take on pretty much anything. Plus, the more extra ingredients you add, the juicier the burger. 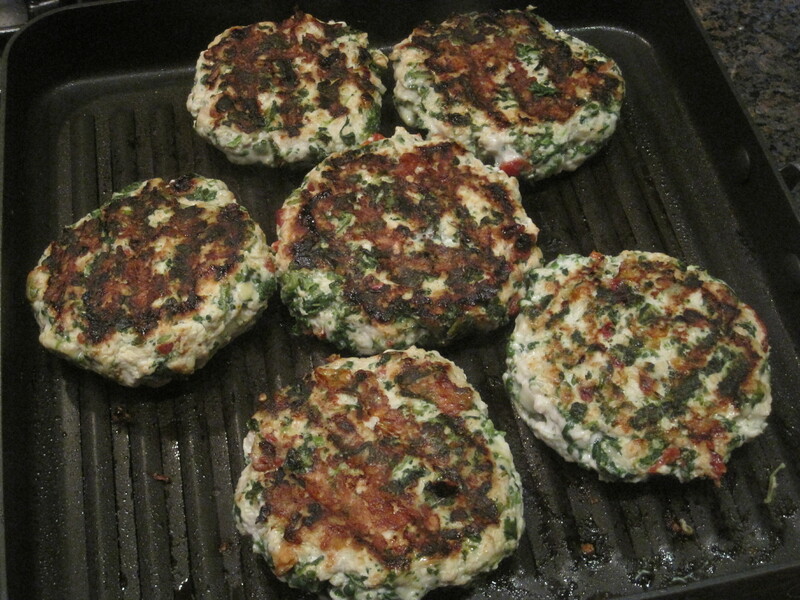 I love the Italian turkey burgers I’ve featured on SeaJetCook before, but this time I’m going Mediterranean. These Mediterranean turkey burgers are super simple to whip up on a weekday night. 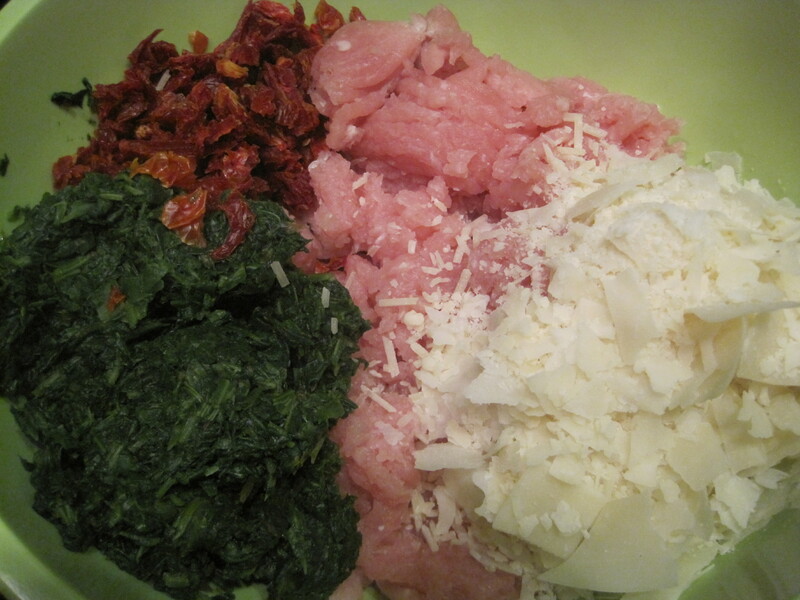 Most of these ingredients are listed in my kitchen staples, but you can almost always find all of them in my kitchen at all times: extra lean ground turkey, frozen spinach, sun-dried tomatoes, Parmesan cheese, and garlic. 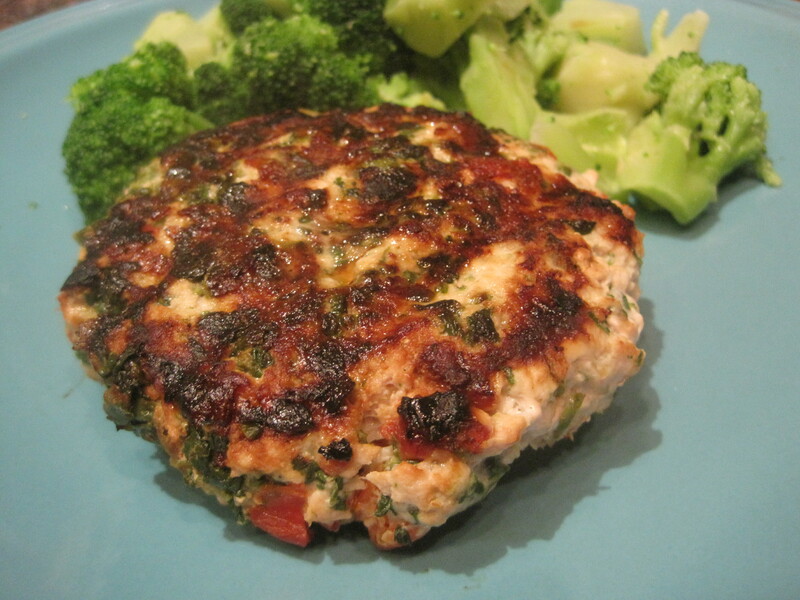 I love adding the spinach to the turkey burger because it adds moisture and fills space with ultra-healthiness. The sun-dried tomatoes add acidity, flavor, and a nice chewy texture; and the Parmesan adds the ooey-gooeyness that tricks you into thinking that this healthy burger is naughtier than it is. It’s as easy as that! I love the sun-dried tomato in here, it adds a really special kick of flavor to the burger. So delicious, so juicy, and so healthy! It’s much easier to mix everything together with your hands, so get in there and get messy! Set your grill pan on medium-high heat and spray with cooking spray (or, get the BBQ up and running!). Because the spinach takes up so much space, this recipe makes about 6 turkey burgers. Section off about 6 equal-sized sections of the turkey mixture. Roll one section into a ball with your hands, then flatten and throw it on the pan. Cover the pan with aluminum foil to keep in the heat and moisture. I definitely understand living a busy lifestyle, so I love how easy this is to whip up. Grill for about 5 minutes on each side. Serve on a bun or by itself, it’s good either way! Stir fry is one of the easiest dinners to make. First of all, it’s a one-pot-wonder so there are very few dishes to clean up after your meal. Second, throw just about any veggie in the pot with the right seasonings and you have a delicious, healthy meal. Third, it’s super easy to double or triple the recipe to make leftover lunches for the week. I like this particular stir fry recipe because you pretty much just dump already prepared veggies in the pot – there’s no need to worry about cooking chicken separately before you start cooking the main meal. It’s also vegetarian, which is great if you’re going meatless (I usually try to go vegetarian one day a week). Plus, it’s overall just plain healthy. In fact, I found the recipe that inspired my own variation from a running magazine featuring great meals for runners’ recovery. 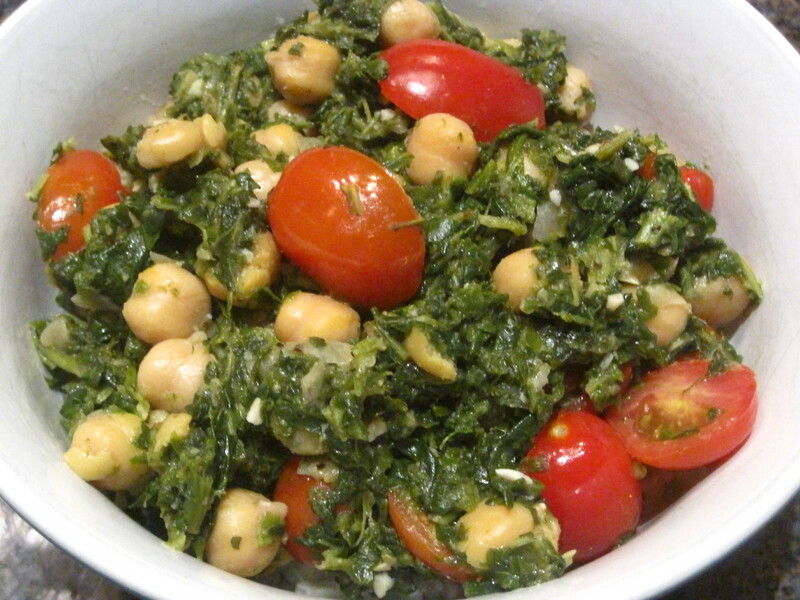 Chickpeas have both protein and fiber, and the spinach adds tons of vitamins and nutrients. Whether you’re recovering from a long run or hard workout, or even if you’re looking for just an easy, healthy weekday meal, throw this recipe together for dinner and an extra couple lunches during the week. And feel free to throw in some extra veggies if you have them in your fridge! This dish is delicious by itself or over quinoa or rice. 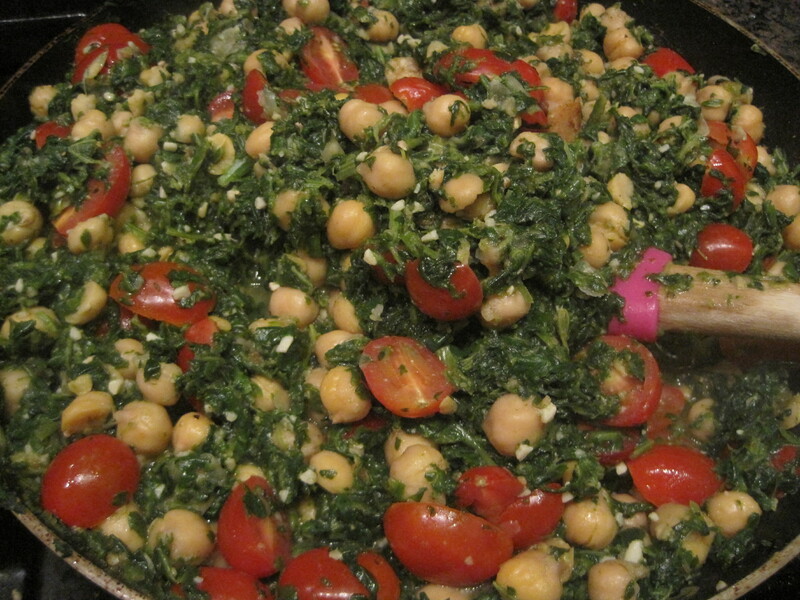 I love the nuttiness of the chickpeas, the tang of the lemon, and the acidity of the tomatoes. Delicious. If your spinach isn’t already defrosted, go ahead and get that going. Meanwhile, set your wok or large pan over medium-high heat on the stove. Add the olive oil, chickpeas, garlic, and ginger. Saute for about 4 minutes. While the chickpeas are cooking, slice your grape tomatoes in half and set aside for later. After the 4 minutes have passed, add the spices and lemon juice. Cook for about 1 minute, then stir in the spinach and tomatoes. Heat through for about 1 minute. This recipe makes 4 good sized servings for 2 dinners and 2 lunches. There’s this divine, mouth-watering cupcake place not too far from my office that first turned me onto “hummingbird” baked goods. Their scrumptious hummingbird cupcakes are filled with fresh banana, pineapple chunks, and vanilla – three of my favorite flavors. For the sake of my skinny jeans, I only allow myself to pass through this cupcake place very rarely and let myself have a hummingbird cupcake as a treat. So when I saw a recipe for hummingbird muffins in one of my running magazines, I jumped at the opportunity of making a more figure-friendly version of one of my favorite indulgences (in fact, I went to the grocery store at 7:00 a.m. the next morning to get a couple ingredients I didn’t have just so I could make them that day). These hummingbird muffins absolutely fill the craving for a sweet, delicious treat without any of the guilt. 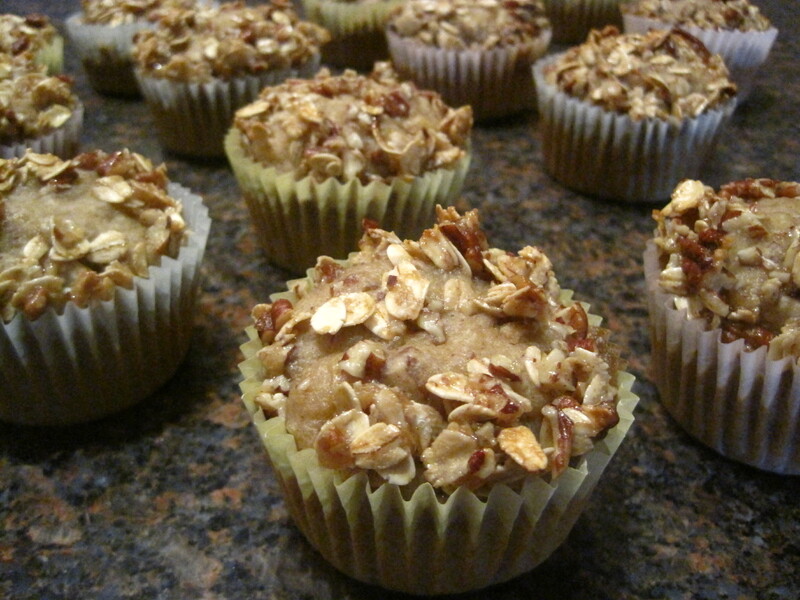 I swap sugar for Splenda in this recipe, and I top them with oats and nuts instead of frosting like their cupcake counterparts. Healthier honey and fruits ratchet the sweetness factor up many notches, so it’s an easy swap for a tempting donut or danish. Plus, baking these in cupcake tins makes this the perfect breakfast to go. Enjoy with a hot cup of coffee and get your morning off to a delicious, healthy start! Delicious, sweet, and much better for you than any donut! Preheat your oven to 350 degrees. Combine sugar and honey in a large bowl, microwave at 50% power for about 45 seconds and then stir. This is what your honey-sugar mixture should look like after it’s heated and combined. Whisk in eggs one at a time until smooth. Add oil and applesauce and whisk. Add fruits and vanilla and whisk again. The mixture should be mostly smooth with only small chunks of banana and pineapple. Set this mixture aside. In another mixing bowl, combing flour, salt, baking powder, baking soda, cinnamon, and pecans. Add the dry mixture to the wet mixture a little at a time, stirring constantly. In a separate bowl, combine all the crumble ingredients and set aside. This is what your crumble should look like. Prep two cupcake trays with nonstick spray or liners (I used liners). Lesson learned when I made these – they’re really sticky so if you decide to go the spray route, make sure you spray the pan really well! Fill each cup about 3/4 full. Sprinkle the crumble mixture on top. 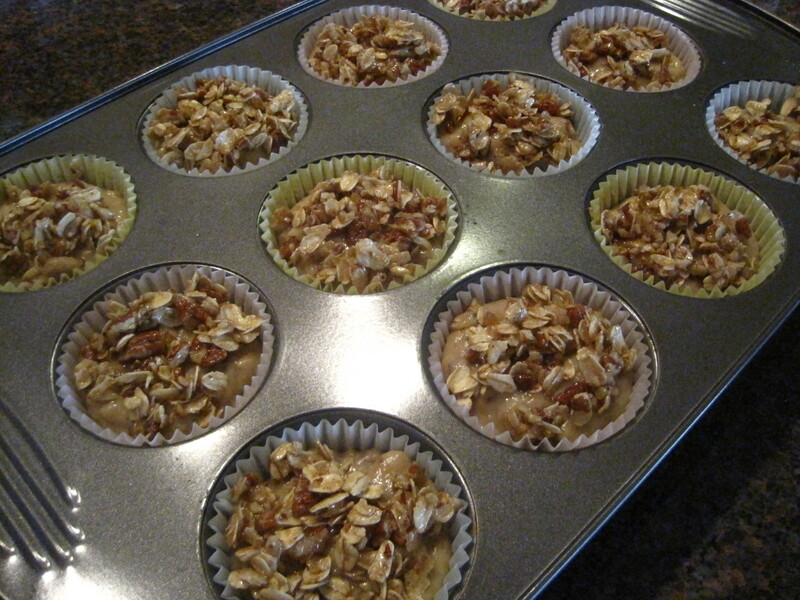 I like cooking these in cupcake tins so that I can have 1, or even 2 if I’m extra hungry, without feeling guilty. Bake for about 15-20 minutes or until a toothpick comes out clean. 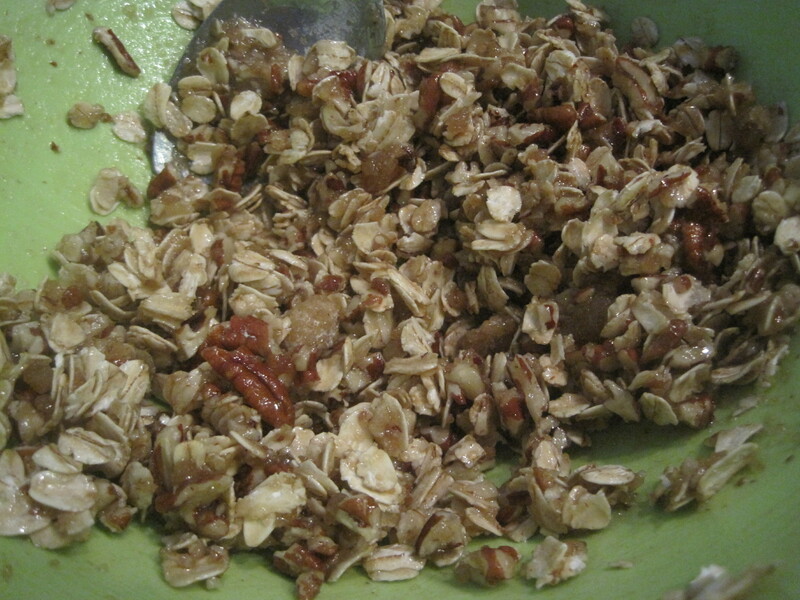 **Need to do something else with those steel-cut oats? Try out my Perfect Oatmeal or my Overnight Oatmeal with Bananas and Coconut Milk. Chicken is one of the most versatile proteins out there. It’s healthy, you can cook with almost anything savory and it’ll taste good, and it’s pretty easy to make. But if you cook it the same way night after night, it gets very boring, very quickly. That’s how I came up with this Healthy Chicken Cordon Bleu recipe. Can I stress how easy this is?! It has three ingredients. That’s right, three. And if you know how to cook a simple chicken breast, then you already know how to make this dish. It takes only about 20 minutes to make, too. Melty, gooey, with a little saltiness from the ham. It tastes naughty! Heat a large pan over medium-high heat and spray with cooking spray. Place your chicken breasts in the pan, cover the pan with aluminum foil, and cook for about 7-8 minutes on each side. After the chicken is cooked through, remove from the pan and slice in half horizontally through the chicken (i.e. butterfly the chicken breasts). 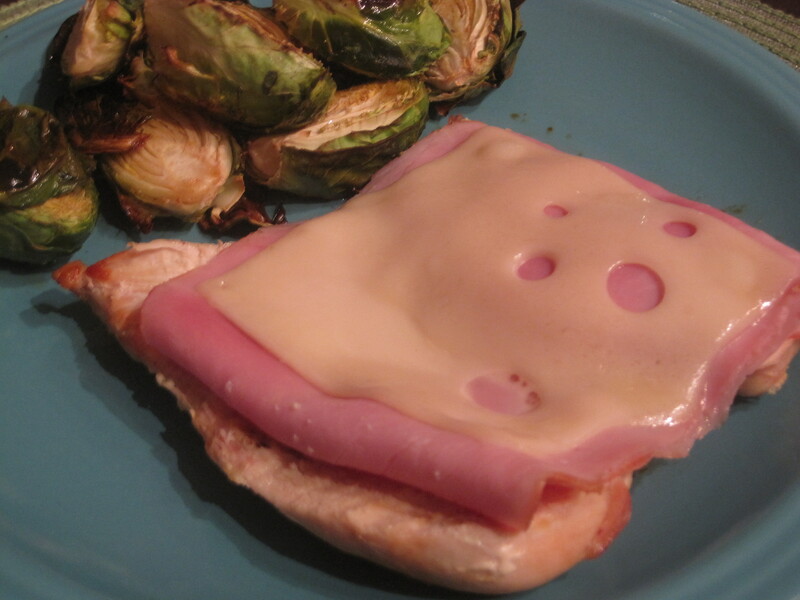 I like to butterfly the chicken so that I have a better chicken to ham and cheese ratio in each bite! 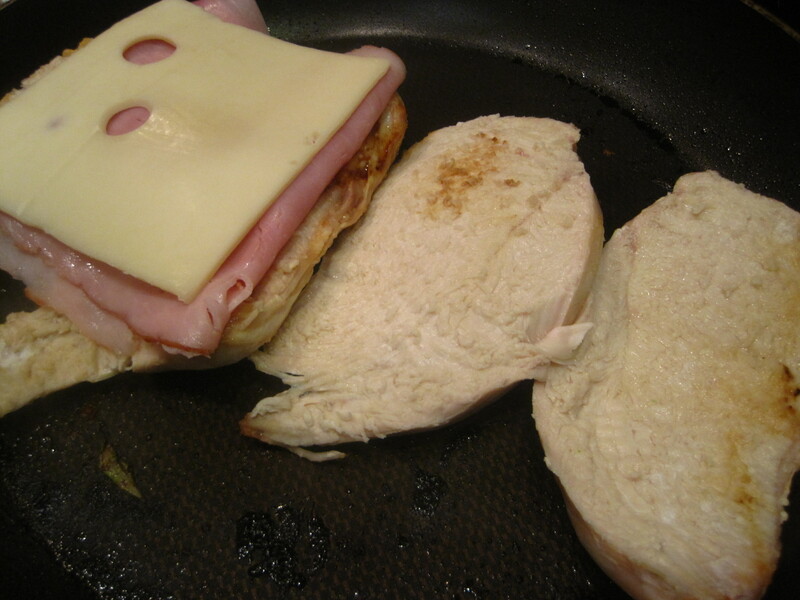 Return the butterflied chicken breasts to the pan and top with two slices of ham on each breast, followed by the cheese. Cook for an additional 2-3 minutes or until the cheese is melted. Serve with some yummy roasted veggies for a delicious, healthy meal! If you like this recipe, you’ll love my Healthy, Yummy Chicken Piccata! I absolutely loved this dip when I made it for the Super Bowl a few weeks ago, so I’m bringing it back for March Madness! 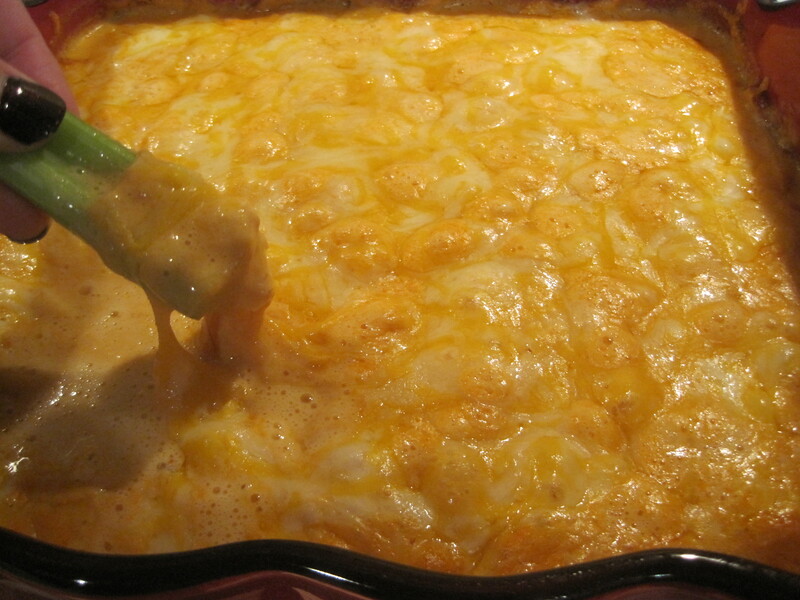 The “skinny” part is deceiving in this gooey, cheesy, rich dip that tastes especially decadent with the shrimp. With only 120 calories per 1/3 cup, you’ll save enough calories to have an extra beer in the second half of the game. You can make this dish as hot as you want by adding more or less hot sauce. So instead of snacking on buffalo chicken wings, try out this tasty dip. Cheesy, gooey goodness. You’d never guess it is healthy! Preheat oven to 375 degrees. Lightly spray an 8×8 baking dish, or any dish of an equivalent size. Combine the cream cheese, sour cream, hot sauce, vinegar, and 1/4 cup of the cheese. Mix until smooth. **Tip: Add the hot sauce little by little until you achieve your desired hotness. 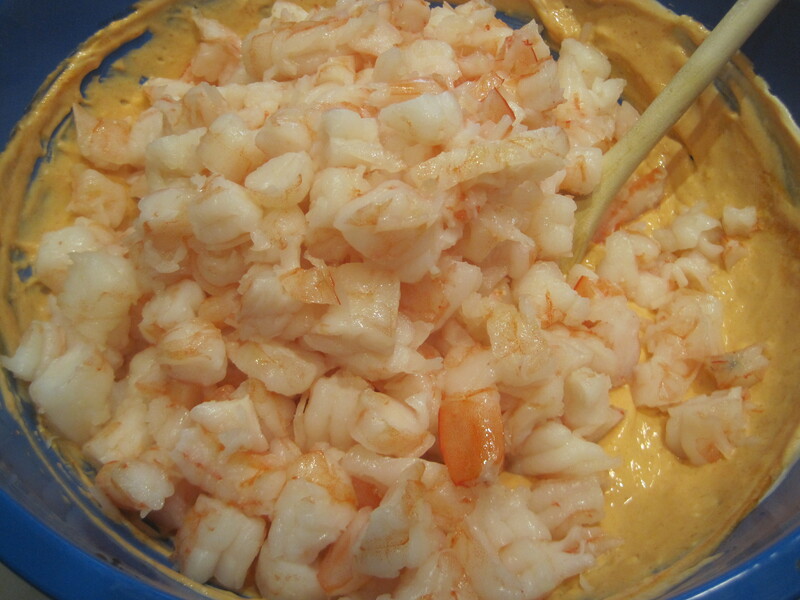 Add the shrimp to the dip and mix. Add it to your baking dish. Keep the chunks of shrimp bite-sized so you can scoop up a bit in every bite. Bake in the oven until hot, or about 20 minutes. Remove from the oven and top with the remaining cheese. Add it back to the oven for about 5 minutes or until the cheese has melted. Let the dip cool for a few minutes before digging in. 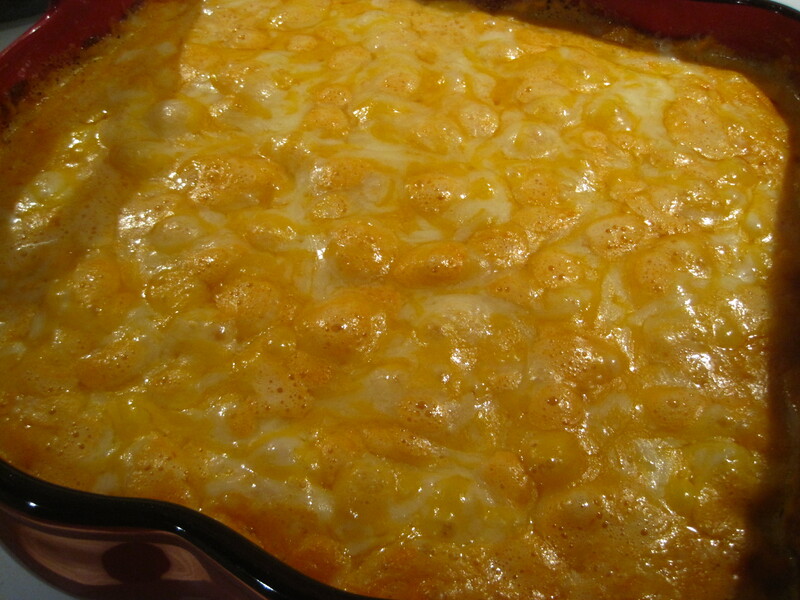 Bake until the cheese bubbles on top. Serve this with carrots and celery to keep it extra skinny, but it’s also delicious with baked pita chips. If you like this dish, try my Tangy Yogurt Veggie Dip! Last month I took a wonderful week-long trip to Ireland. While many people look forward to seeing the sights, I may be the only person to ever look forward to Irish food. In a perfect world where calories don’t matter, pub grub would be my main food group. While in Ireland, I ate an abundance of fish and chips, mashed peas, shepherd’s pie, and Irish stew while I listened to musicians play traditional Irish music in cozy little pubs – of course, all paired perfectly with a rich, delicious pint of Guinness. As the trip came to an end, so did my lavish eating of hearty, tasty pub grub. But with St. Patrick’s Day only two days away, I’m bringing it back for the special occasion. You may think I’m crazy and think that Irish food is bland, but I will prove otherwise. 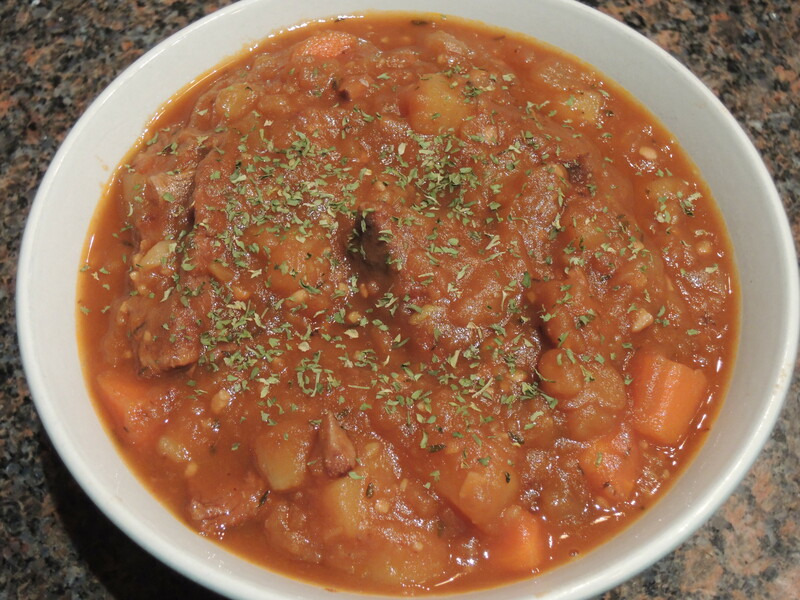 This Irish stew has an amazing depth of flavor, layered with the smokey, chocolatey Guinness, fruity red wine, earthy thyme, spicy garlic, and sweet onion and carrot. Of course, you couldn’t have a hearty Irish stew without potatoes. It takes a little bit of time and love, but this dish is really easy to make. Whether you’re Irish or not, throw it on the stove this Sunday and celebrate the holiday. Find the biggest pot or Dutch oven you have, at least 5 quarts. Heat the pot over medium-high heat and add the olive oil. Salt the beef and add to the pot. Spread them out as much as you so that they make up one layer. Brown the meat on one side for about 3 minutes and then use tongs to turn the pieces over to brown on the other side. Continue cooking in this manner until all sides are browned. If the pot is crowded (like mine), turn the heat up to high and cook for a shorter amount of time so the meat browns, not steams. Add garlic to the beef and saute for one minute. Add the beef broth, Guinness, red wine, tomato paste, sugar, thyme, Worcestershire sauce, and bay leaves. Stir the mixture to combine. Bring it to a boil then reduce heat to medium-low. Cover and cook for one hour, stirring occasionally. This looks super brothy, but it will cook down while it simmers a bit. The potatoes also thicken it up later. **You only need one cup of Guinness, so enjoy the rest while you’re cooking! While the meat and stock are simmering, put another large pan or pot over medium heat and melt your butter. While the pot heats, peel and chop your potatoes. Add your potatoes to the pan in batches as you chop them. Turn the potatoes in the pan every few minutes to evenly cook them. As soon as you get the potatoes in the pan, start on the carrots. Peel and chop your carrots and fold them into the potatoes so the mixture can evenly cook. Once the carrots are in, chop the onion and add it to the mixture. 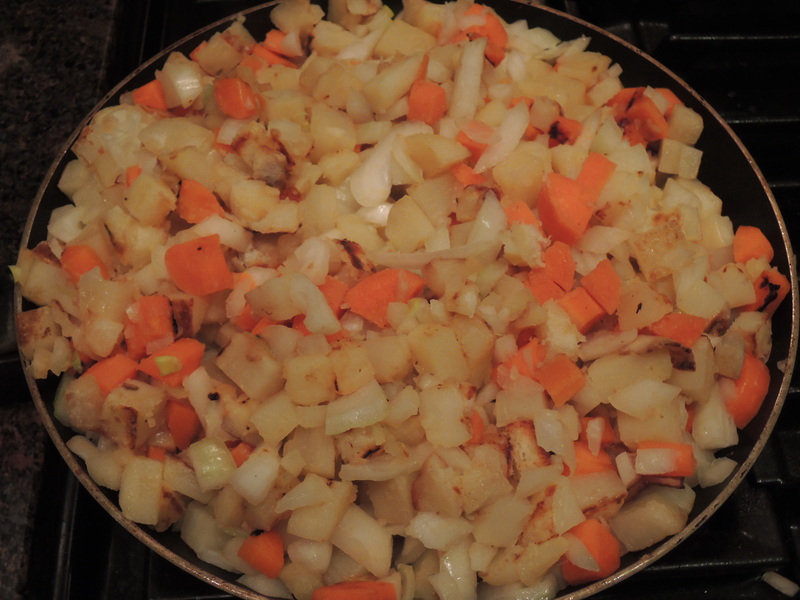 Let the potato, carrot, and onion mixture cook on medium heat for about 20 minutes or until soft. Use a much bigger pan than I did! Turn the veggies over constantly so that they evenly cook. **I like to get the potatoes in the pan as early as possible. If there’s one thing I hate more than anything else, it’s an undercooked potato. After the beef and stock have simmered for one hour, add the vegetables to the stew. Simmer uncovered until the vegetables and beef are very tender, or for about 40 minutes. If the stew looks really thin or watery when you first add the vegetables, have no fear – the starch from the potatoes thickens it up. Add salt and pepper to taste, and top with parsley for a pop of color. If you’re looking for other fun St. Patrick’s Day recipes, try my Sweet Potato and Turkey Chili Shepherd’s Pie or my Chocolate Guinness Cupcakes! Andouille sausage, shrimp, brown rice, loads of veggies, and a kick of hot sauce … need I say more? This simple slow cooker dish is packed with flavor and texture. It’s perfect for a lazy Sunday at home while we wait for the weather to turn slightly nicer, and it makes delicious grab-and-go leftovers to pack for lunch during the week. The best part is that it’s healthy, though you’d never guess it. You can add whatever veggies you have lying around the kitchen that need to be eaten, and the hefty dose of satiating protein and healthy whole grains keep you from heading back to the fridge for a midnight snack. It’s a fun dish to throw into the week’s lineup! This dish is a quadruple threat: delicious, hearty, healthy, and easy to make! Start by chopping and mincing all your veggies. 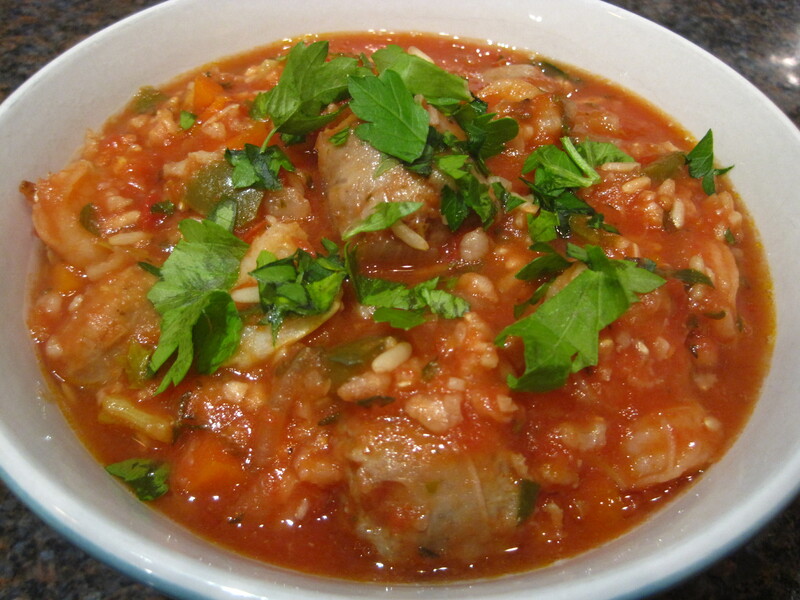 Place the onion, garlic, celery, carrots, peppers, tomatoes, rice, and sausage in your slow cooker in that order. Add the hot sauce, thyme, salt, pepper, and water. In the last hour of cooking, add your shrimp and parsley. Stir to combine. Nothing sounds better on a freezing cold night than a big bowl of chili. It’s warm, hearty, delicious comfort food – but it can be healthy comfort food! The best thing about chili is that you can pretty much add whatever ingredients you want as long as you have the basics: meat, beans, beer, and the right spices (that’s right: beer). I may be biased, but I believe my mom makes the best chili. When I called her to ask her for the recipe (for about the 15th time), she replied, “Well, I just add a little of this and a little of that.” I asked, “Well do you know how much chili powder or cumin you add?” She answered, “I add enough to make it taste good.” So I improvised. That’s why I call it my mom’s crazy chili recipe – there really isn’t any set recipe. But those basics I mentioned are in there, and that’s the key. I also truly believe that beer is the secret ingredient to setting this one over the top. I’m going to break down necessary ingredients and optional ingredients. I’ll also give you healthy and indulgent options. Lastly, you can make this either on the stove or in the crock pot, so I’ll give you both options there, too. However, there is one area where you don’t have an option: you cannot make just a little bit of chili. You have to make a giant pot. But that’s a good problem to have because chili makes the best leftovers! This one was hard to tag because you can make it as healthy as you want! As long as you have the basics, it’s delicious. 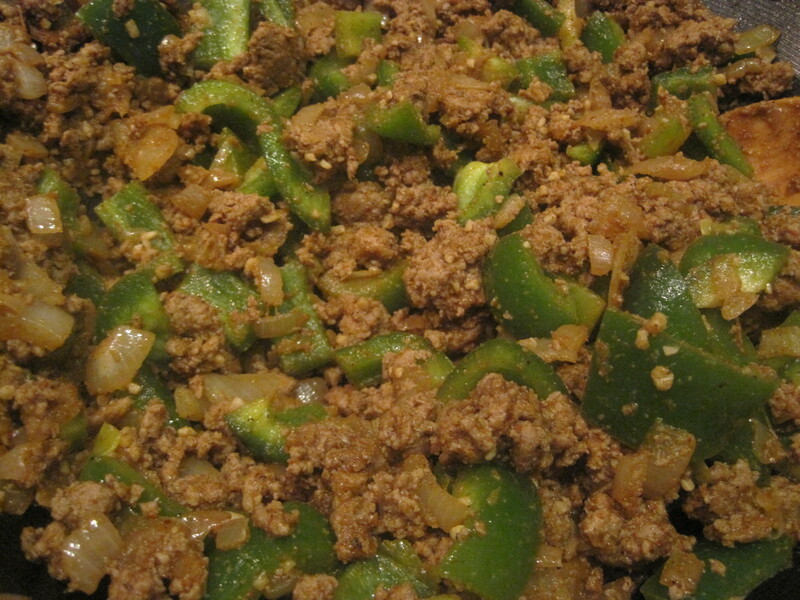 1-1.25 pounds ground meat – use ground turkey for a healthier option, but I love the taste of ground beef. 4 teaspoons minced garlic – not necessary to have fresh garlic, but garlic in general is necessary. Use more garlic powder if you don’t use fresh garlic. 1 tablespoon garlic powder – garlic powder is necessary, even if you use fresh garlic. If you don’t use fresh garlic, too, then triple the garlic powder. 1 can or bottle of dark beer – ales, nut browns, stouts, or porters are the best. In a pinch, you can use a light beer, but stay away from IPAs. 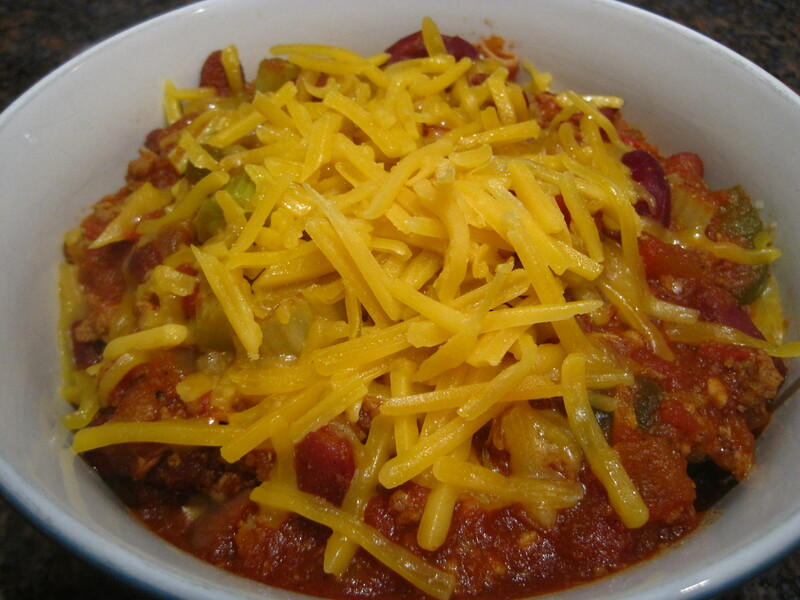 Cheddar cheese – I love topping my chili with cheese! 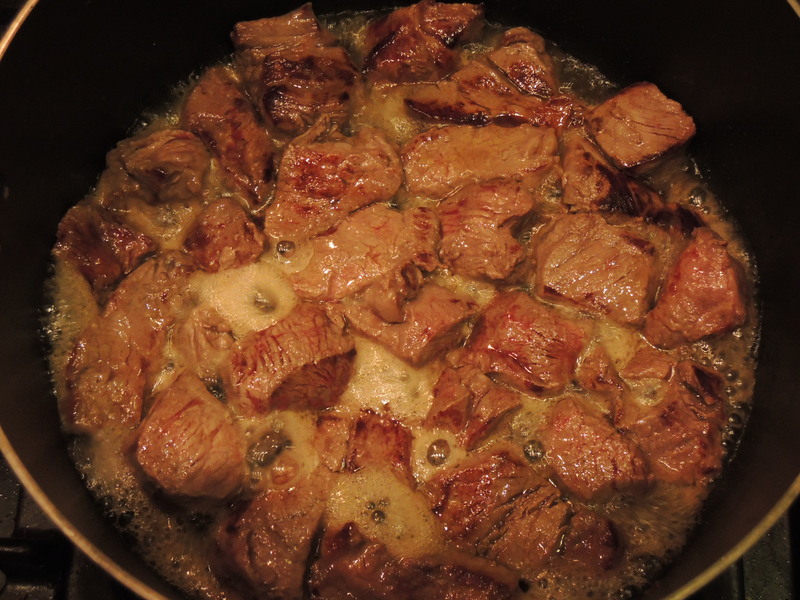 Brown your meat in the two tablespoons olive oil over medium-high heat on the stove for about 5-7 minutes. If you’re going to use a crock pot, use a large pan. If you’re going to make the chili in a pot on the stove, just brown the meat in the pot. As the meat is browning, constantly break it apart with a wooden spoon. You want the meat to be smaller crumbles instead of large chunks. Or, as an alternative, cook the bacon in the pan first. Cut or tear the bacon into smaller pieces and put them in the pan so that they cook faster and so you don’t have to crumble it later. If you’re cooking turkey bacon, cook the turkey bacon in the olive oil. If you’re cooking regular bacon, don’t put any oil in the pan. Then brown your meat in the same pan with the bacon drippings. When the meat has browned, turn the heat down to medium and add the onion. If you’re using fresh garlic or bell peppers, add those at this time, too. Cook for about 3 minutes or until the onion has turned translucent. Add all your dry spices, except the bay leaves, and stir with the spoon until the spices thoroughly coat the meat and veggies. I used turkey chili here, but the spices added the darker color. If you’re cooking in a crock pot, transfer the meat and veggies into the crock pot. 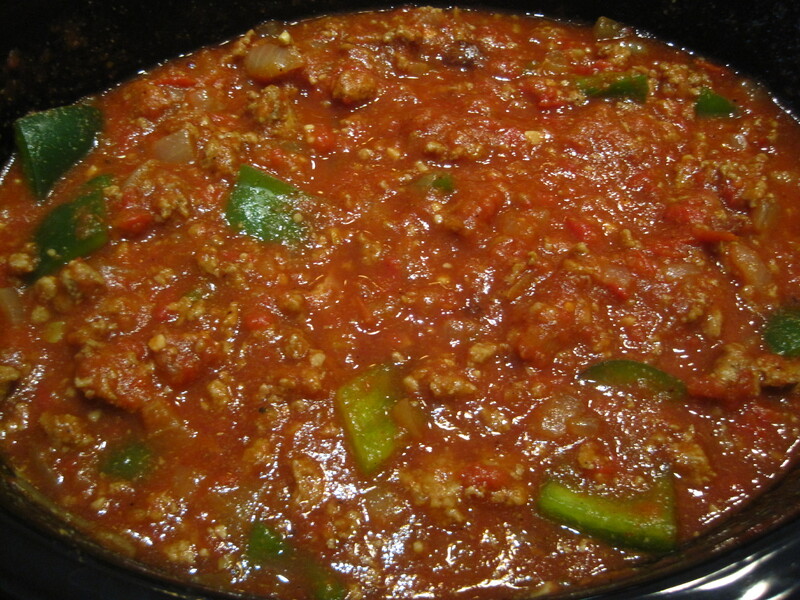 Add the can of crushed tomatoes, beer, and bay leaves, either in the crock pot or big pot on the stove. Stir to mix. Cover and let cook for many hours. If you’re using the crock pot, set on low heat for at least 6 hours – you can let this cook all day if you’re making it on a work day. 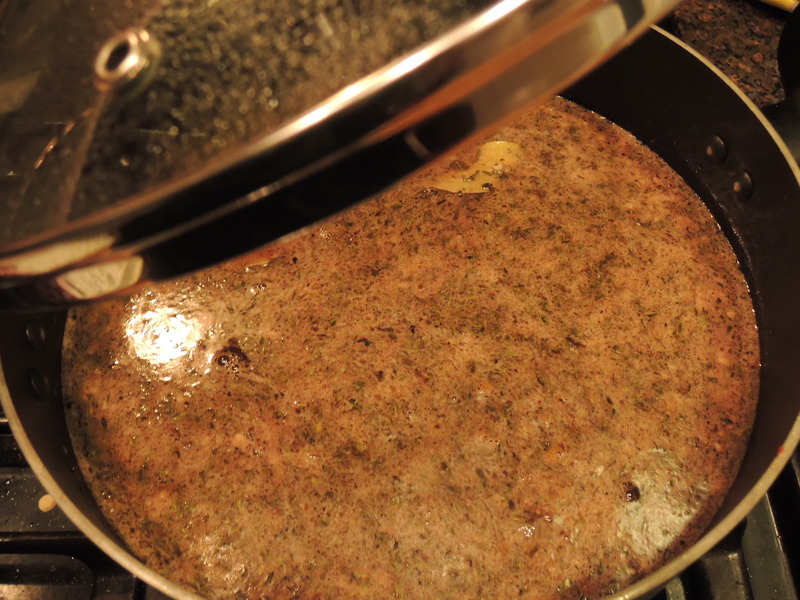 If you’re cooking on the stove, turn the heat to low and let simmer for at least 4 hours, stirring occasionally. The chili generally tastes better the longer you let it cook. This will make your house smell wonderful all day! In the last hour of cooking, add your kidney beans. You can also add celery or carrots at this time if you’re using them. Stir and cover. I love serving my chili over rice and topping it with cheddar cheese. In my family, we’ve also been known to put chili over tamales, but that may be a Southern California thing. Of course, chili is also delicious on hot dogs, fries, or other ballpark food. I’ve also heard of people putting chili over noodles. If you want to make it healthier, chili would also be good over quinoa. But you don’t have to pair it with anything at all – this chili is also delicious all by itself. When I first offered to host Thanksgiving, nothing intimidated me more than cooking the turkey. Potatoes and stuffing are easy and very forgiving with flavors and cooking time. And besides, turkey is the main event. 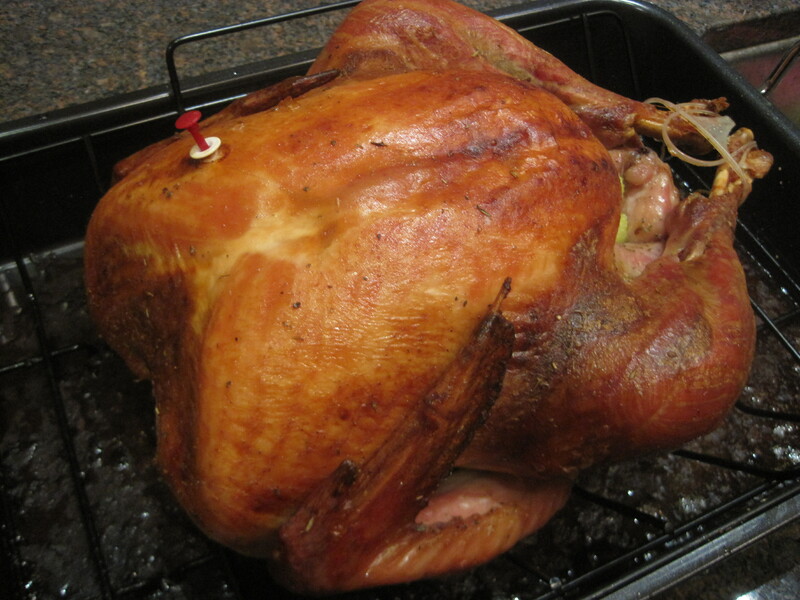 But I’ve tasted way too many dry, overcooked turkeys in my life to think I could cook one easily. How do I defrost the damn thing? How long do I cook it? What kind of seasonings do I use? Is it the stuffing that adds the flavor? (Remember, I don’t like stuffing in the turkey). How do I get the crispy outside and juicy inside? I was lost. I read recipe after recipe trying to figure out the trick to keeping it moist and tasty. And, I admit, I called the Butterball Hotline. My fears weren’t assuaged, but I figured there was nothing left for me to do but jump in and give it a shot. I narrowed down my recipe collection to one basic, easy-looking recipe. I figured it was a good start and I could always add more or edit later if I needed to. By some stroke of luck, it was delicious. The turkey was crispy on the outside and juicy on the inside. And I have used the same turkey recipe without any changes or additions every year since. The trick, I learned, is brining. Soaking the turkey overnight in a sugar-salt mixture makes the turkey super juicy, and I don’t really add much seasoning past that! It turns out that cooking a delicious, juicy turkey is really easy. It takes a long time, but not a lot of attention. So if you’ve ever been too afraid to cook a turkey, fear no more. Give it a try and I promise you’ll find it’s a lot easier than you think. Golden-brown, juicy, and delicious. There’s never a reason to be scared of cooking a turkey again! **Tip: You can scale the ingredients up or down based on the size of your turkey. The night before Thanksgiving, start by cleaning and brining the turkey. Remove everything from the cavity (giblets, neck, and plastic bag) and discard. 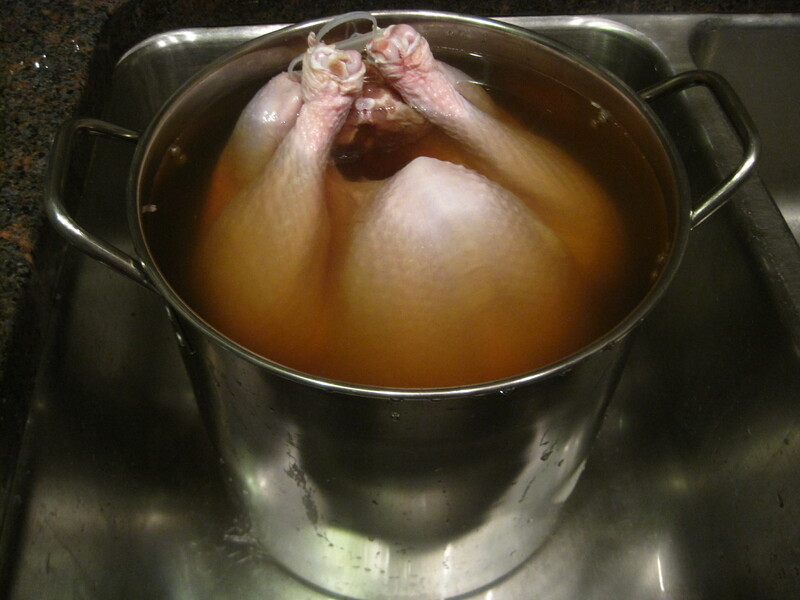 Place the turkey in the sink and thoroughly rinse the inside cavity and skin with cool water. This helps remove any bacteria within the cavity or on the skin. In a very large pot, heat about 2 quarts of water, salt, and sugar over high heat. Stir until the salt and sugar dissolve. Add the remaining gallon and a half of water to help it cool faster. Cool to room temperature then submerge the turkey in the brine. This takes about an hour to prepare the brine, so don’t do it too late! Refrigerate overnight. Be careful, that thing is heavy! Remove the turkey from the brine. Pat the turkey dry and place in a roasting pan. 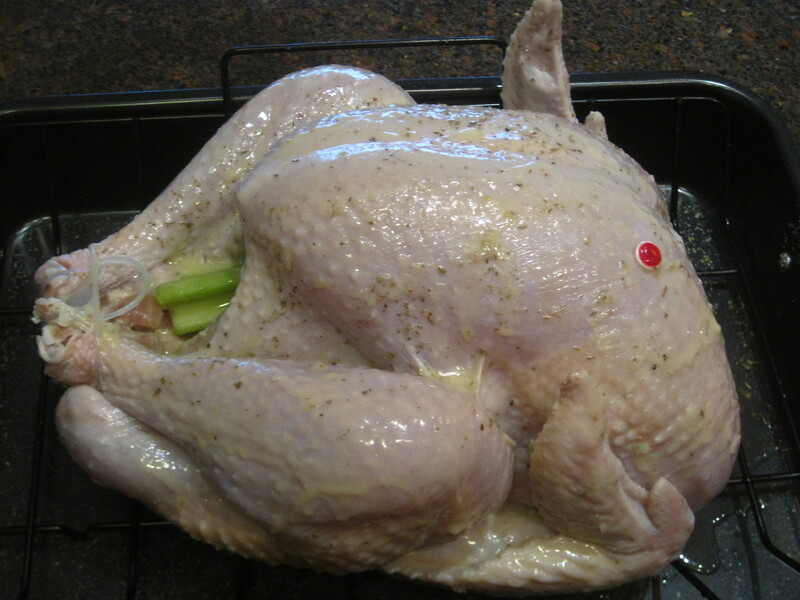 Brush the turkey all over with melted butter, and season with garlic salt and Italian seasoning. Cut your two small onions in half and remove the skins. Cut the celery stalks into 4 pieces each. Stuff the turkey cavity with the onion halves and celery stalks for added taste and juiciness. This guy is ready to go in the oven. Every hour or so, brush the turkey with more melted butter. This makes the skin nice and crispy. Cook to an internal temperature of 165 degrees. **Tip: I can’t stress the importance of having a good meat thermometer. They’re not expensive, but they really help when cooking meat in the oven. They save you from having to cut open the meat to check doneness and letting the juices all run out! After the turkey is done cooking, transfer to a cutting board and tent loosely with aluminum foil. Let it rest for about 30 minutes before carving. Turkeys don’t have to be cooked only for Thanksgiving. Try cooking one in the off-season. I already have a couple small turkeys in my freezer waiting for a good winter weekend. If you read my Sourdough Bread Stuffing recipe, you know I’m not the biggest fan of cooking inside the bird. Sorry if I offend anyone, but it grosses me out. The same goes for gravy. I like other, non-inside-the-bird ingredients in my gravy, too. More than anything, I think it tastes better. Plus, then you can make either the stuffing or the gravy even if you’re not making turkey. It is packed full of flavor from garlic, rosemary, thyme, and shallots without tasting like the inside of bird. This gravy would be delicious over chicken or potatoes, on a sandwich, or even over beef. Added bonus: it only takes about 10 minutes to make, so it’s easy to pop on the stove while you’re cooking everything else. **Tip: Fresh herbs are better, but you can raid your spice cabinet if you don’t want to make the trip to the market. If you use dried herbs, double the amounts. Place a medium saucepan over medium-high heat and add your olive oil. 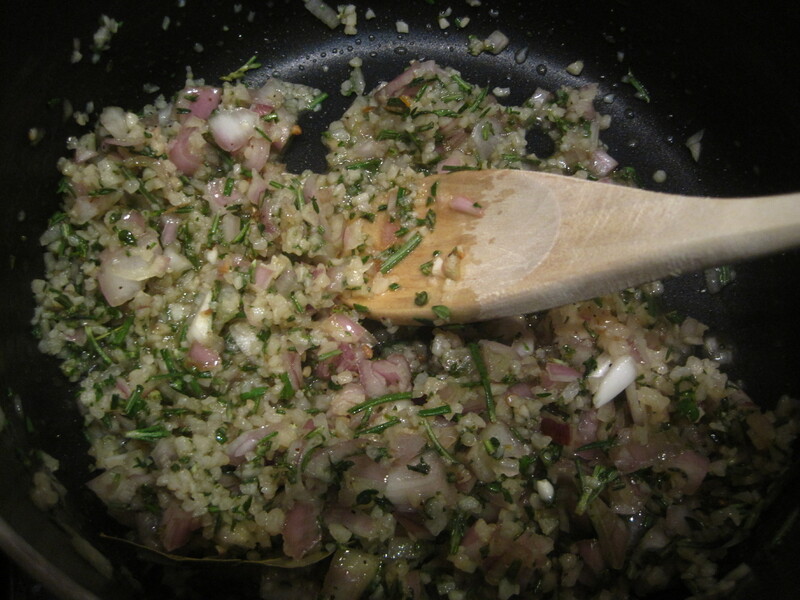 Add the minced shallot, garlic, rosemary, thyme, and bay leaf. Cook until the shallot is tender, or about 3 minutes. The smell of this is incredible. I can’t imagine making gravy any other way! 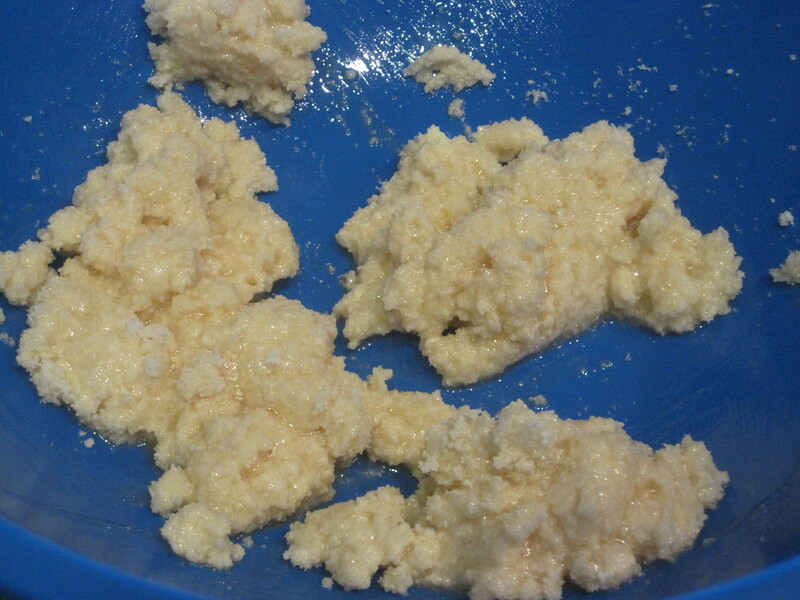 While the shallot mixture cooks, make a paste with the butter and flour in a small bowl. **Tip: The flour is going to be what thickens the gravy, and it’s really important to make this paste separately – do not add the flour straight into your gravy or you’ll get little lumps. Whenever you’re making a roux, always make a paste with the flour before your add it into your gravy or sauce. Add the broth to the shallot mixture and scrape up any browned bits from the bottom of the pan with a wooden spoon. Bring to a boil, then whisk in the butter/flour mixture. Boil until sauce thickens to make a gravy, or about 5 minutes. Remove and discard the bay leaf.